Christians are one of the world’s most highly educated religious groups: The vast majority of Christian adults ages 25 and older (91%) have at least some formal schooling, and one-in-five have post-secondary degrees. Gender differences in educational attainment among Christians have narrowed in recent generations, largely because of gains made by Christian women. Although Christian women are still slightly more likely than Christian men to have no formal schooling, roughly equal shares of Christian men and women have a post-secondary education. In fact, in the youngest cohort analyzed in the study, Christian women are now somewhat more likely than men to have received higher education. And in some countries, Christian men have experienced declines in post-secondary education across recent generations. For instance, in the United States, the country with the world’s largest Christian population, 34% of the youngest Christian men in the study (those born 1976 to 1985) have post-secondary degrees, compared with 37% of the oldest Christian men (born 1936 to 1955). Christians – who make up the world’s largest religious group at 2.2 billion people, including more than a billion adults 25 and older in 2010 – are more geographically dispersed than adherents of other major religions, and they show a wide variation in educational attainment across different regions. 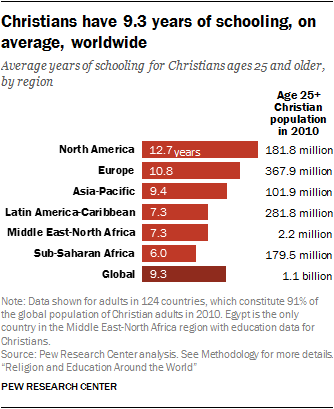 Globally, Christians have spent 9.3 years in school, on average. But regionally, this average ranges from 12.7 years in North America (where the Christian population is projected to increase slightly from 267 million in 2010 to 287 million in 2050) to 6.0 years in sub-Saharan Africa (where Christians of all ages are expected to grow rapidly from 517 million in 2010 to 1.1 billion by mid-century). There also are wide variations across regions in the shares of Christians with higher education. In North America, 38% of Christians have post-secondary degrees, as do almost a quarter in three other regions (Middle East-North Africa, Europe and Asia-Pacific). 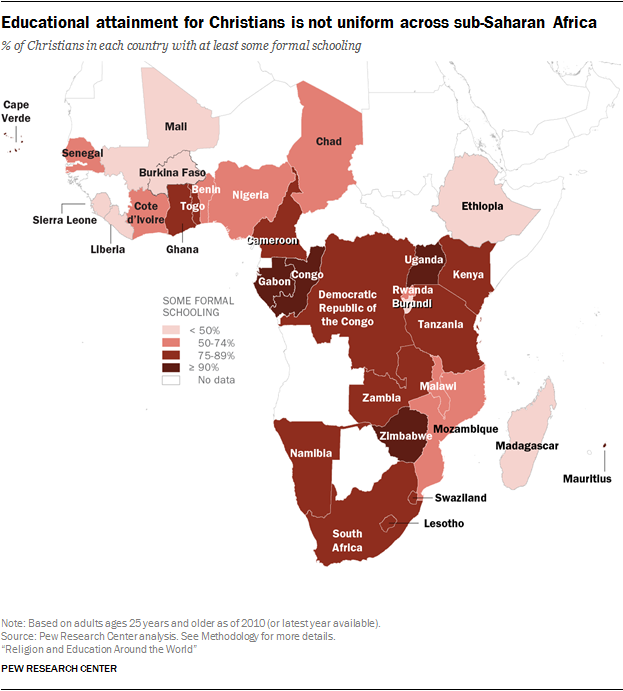 In sub-Saharan Africa, the share with post-secondary schooling is 6%, while the share of non-Christians in that region with a higher education is 3%. The gender gap in educational attainment among Christians is relatively modest. 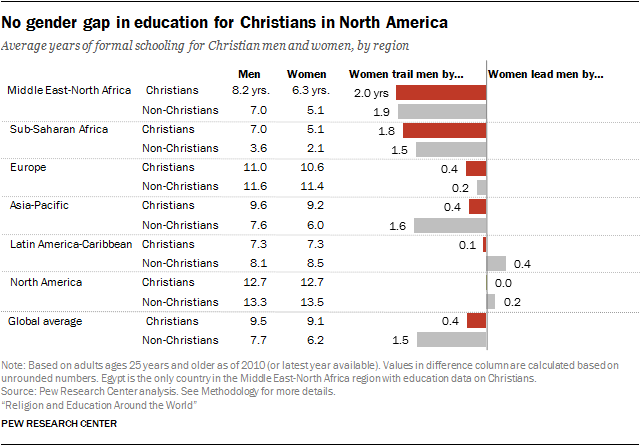 While Christian men around the world have 9.5 years of schooling, on average, Christian women have received 9.1 years. Similar shares of both Christian men and women have at least some formal schooling (90% of Christian women and 93% of Christian men) and post-secondary degrees (20% of Christian women and 21% of Christian men). These gender gaps are wider, however, in certain parts of the world. 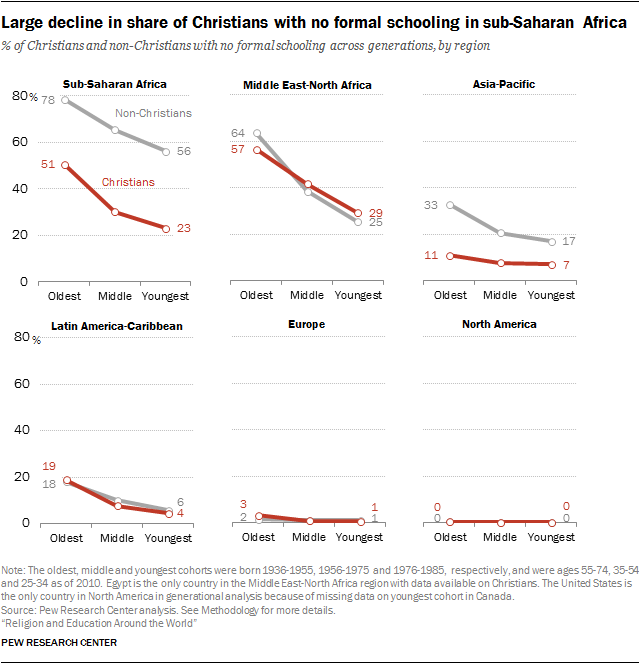 In sub-Saharan Africa, for example, Christian women have 1.8 fewer years of schooling, on average, than Christian men. But in North America and Latin America, there is virtually no gender gap in educational attainment for Christians. Christians have made relatively modest gains in overall levels of education across the three generations studied, and most of these gains appear to have occurred between the oldest generation in the study (born 1936 to 1955) and the middle generation (born 1956 to 1975). There have been no substantial gains between this middle generation and the youngest group of Christians in the study (born 1976 to 1985). For example, after an increase of almost a full year of schooling between the oldest and middle age cohorts (from an average of 8.9 years of schooling to 9.8 years), Christians in the youngest cohort have not made similar gains, averaging 9.9 years of schooling. 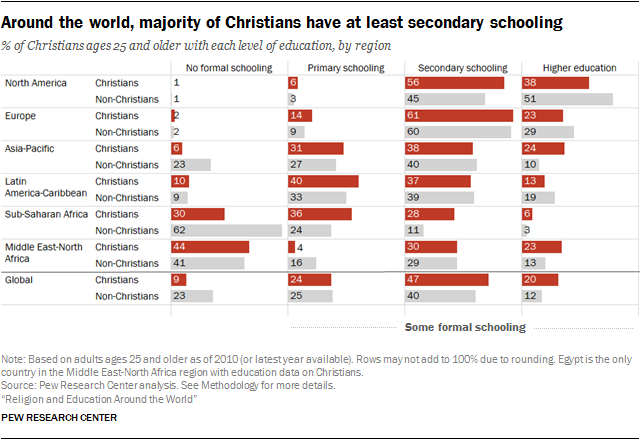 Additionally, the share of Christians with at least some formal schooling is comparable for the middle and youngest cohorts (92% and 93%, respectively). And the share of Christians with post-secondary degrees has held steady at 23% between these two generations. One reason for this global pattern in Christians’ educational attainment is the geographic shift in the Christian population. Historically, Europe and North America have been home to a majority of the world’s Christians; as of 2010, some 59% of those in the oldest generation of Christians live in these two regions. But only 36% of the youngest Christians live in these two regions. Indeed, Christians outside Europe and North America are projected to account for increasingly larger shares of the global Christian population. And because educational attainment in other regions is lower than that of Christians in Europe and North America, the global average for all Christians is tugged downward. According to analysis of available data, if the regional distribution of Christians hypothetically had stayed the same across generations, the global average of years of schooling for Christians would have been one full year higher. But there is considerable diversity in Christian educational attainment throughout the region. In Nigeria, for example, three-quarters (74%) of the Christian population – the largest in Africa – has some formal education and 46% have at least secondary schooling. Christians in Kenya are even more educated. Almost nine-in-ten (89%) have some formal schooling and 55% have secondary schooling or more. Next door to Kenya in Ethiopia, however, Christians are much less educated. Fewer than one-third (30%) have any formal schooling, and relatively few Ethiopian Christians (8%) have secondary schooling. But Christian women in sub-Saharan Africa are making bigger strides than men across generations, especially when it comes to gaining some basic schooling. The share of Christian women in the region with at least some formal education increased by 36 percentage points (36% to 72%) between the oldest and youngest generations in the study, while the comparable increase for Christian men was 18 percentage points (65% to 83%). Across the three generations in the study, Christian women have made greater gains than Christian men in many indicators of educational attainment. These gains have nearly erased the global gender gap among Christians, and, in some regions and countries, led to a gender gap reversal – in the youngest generation, women have more education, on average, than men. For instance, in average years of schooling, Christian women worldwide rose from 8.6 years of schooling to 9.8 years between the oldest and youngest cohorts, while men gained less than a year of schooling across generations (9.4 years to 10.0 years). In four regions of the world, the youngest Christian women have at least as many years of schooling, on average, as the youngest Christian men. In North America, Christian women born between 1976 and 1985 have an average of 13.2 years of schooling, compared with 12.8 years for their male peers. In Europe, the youngest Christian women average 12.6 years of schooling, compared with 12.0 for Christian men.15 And in the Asia-Pacific and Latin America-Caribbean regions, the youngest Christian men and women average virtually the same number of years of schooling. Larger gains among women also help explain a slight narrowing of the global Christian gender gap in some basic schooling. The share of the youngest Christian women with at least some formal schooling rose to 91%, compared with 94% among the youngest Christian men. In three regions – North America, Europe and Latin America and the Caribbean – the gender gap by this measure has disappeared among the youngest generation of Christians. The gender gap reversal for Christians is especially apparent when it comes to higher education. Worldwide, the youngest Christian women are 5 percentage points more likely than the youngest Christian men to have post-secondary degrees. The reversal is due not only to women’s gains but also to generational stagnation in the share of Christian men with post-secondary degrees. About one-in-five of the oldest Christian men around the world have post-secondary degrees (21%), as do 20% of the youngest Christian men. At the same time, the share of Christian women with higher education has risen from 17% among the oldest generation to 25% among the youngest. Stagnation in higher education attainment among Christian men is especially notable in the United States, where the share with post-secondary degrees has decreased slightly from 37% in the oldest generation to 34% in the youngest. This change, combined with women’s gains, means that in the youngest generation of U.S. Christians, women are more likely than men – by 10 percentage points – to have a post-secondary education. Christian men are not alone in seeing a decline in the share with higher education: The same pattern is also seen in the youngest generation of Jewish men. Moreover, for Jews and the religiously unaffiliated, the global gender gap in higher education also has reversed, so that the youngest Jewish and unaffiliated women are more likely than the youngest Jewish and unaffiliated men to have higher education. Christians are at the forefront of a global trend that also is occurring among Jews and unaffiliated people: the reversal of the historical gender gap in higher education. In the youngest generations of these three religious groups, women are more likely than men to have post-secondary degrees. For Christians, this is particularly apparent in Europe. Across the continent, 43% of the youngest Christian women have post-secondary degrees, a 25-percentage-point increase from the 17% with higher education in the oldest generation of Christian women. By contrast, the share of Christian men with higher education grew by 7 percentage points, from 22% in the oldest generation to 30% in the youngest. As a result, the youngest Christian women are more likely than the youngest Christian men – by 13 percentage points – to have higher education. By comparison, 36% of the youngest non-Christian women have post-secondary degrees, a 10-point gain over the 26% with higher education among the oldest non-Christian women (mostly religiously unaffiliated people and Muslims). The youngest non-Christian women also are more likely than the youngest non-Christian men to have higher education, but only by 3 points. The largest reversals in the European Christian gender gap in higher education have occurred in Norway, France, Germany, Montenegro, Belgium and Iceland. Among the oldest cohorts in Norway, France and Belgium, Christian women are less likely than Christian men to have a post-secondary education by 4 percentage points or more, but in the youngest cohort, they are more likely by at least 15 points to have such a degree. And in Montenegro, Christian women in the oldest cohort are behind men by 13 percentage points by this measure, but the youngest are ahead by 9 points. Kosovo is the only European country with available data where the youngest Christian women still lag slightly behind men in the share with higher education. Besides Europe, the youngest Christian women also are more likely than the youngest Christian men to have post-secondary degrees in North America, Asia and the Latin America-Caribbean region.